Have you ever sat back and actually thought how glamorous it feels when you apply skincare? 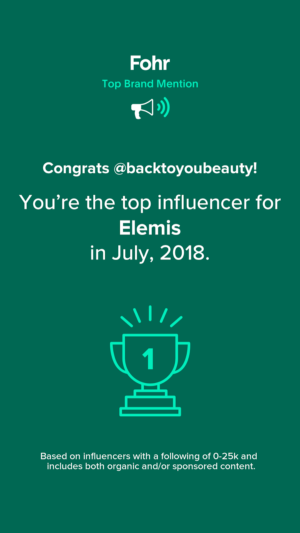 When I saw the Elemis Lift & Firm 4 piece collection, with its decedent packaging, it really reminded me of those 1950’s Hollywood starlets applying their skincare at a beautiful dressing table. You see, too many times, people rush their skincare or….heavens above…don’t use any because they see it as too much of a faff. 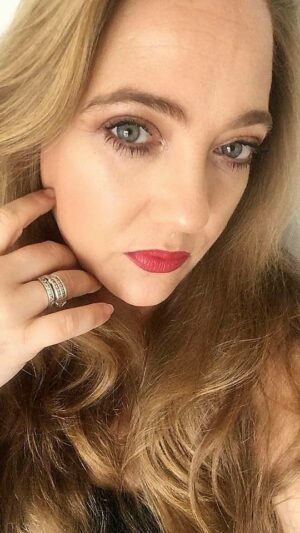 I believe that once you know what your skin wants and needs and you find a brand or range that really works for you, it becomes a pleasurable indulgence, that achieves great results. This is what I have found with Elemis, this great, British brand that I have loved and used for 25 years. 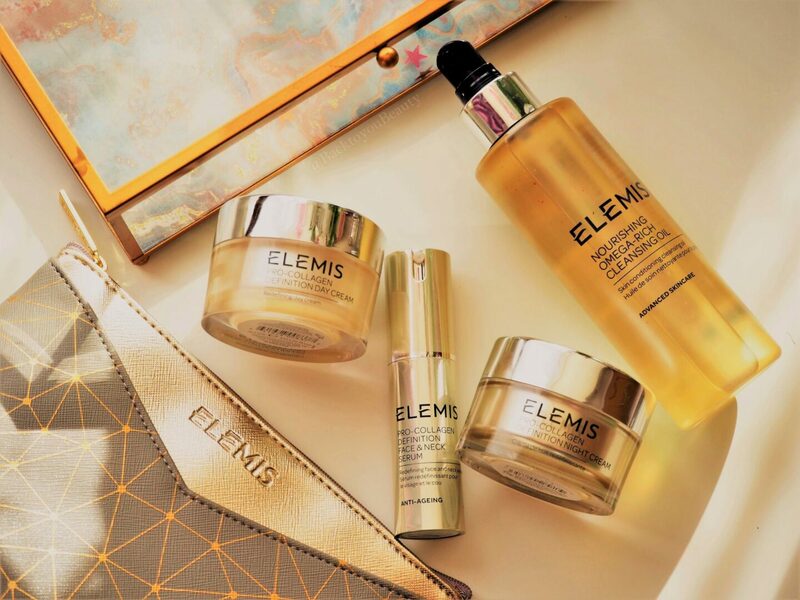 The Elemis Lift & Firm 4 piece collection, the first Todays Special Value from the brand of 2019 on QVCUK, is one of those ranges that is to be enjoyed. It is perfect for this cold time of year, when we want to awaken our Winter skin and prepare it for those warmer, brighter days of Spring. Take the time to sit, indulge and nurture you Winter ravaged skin with beautiful ingredients that will firm and lift the skin, leaving it looking glowing and fresh and feeling loved. 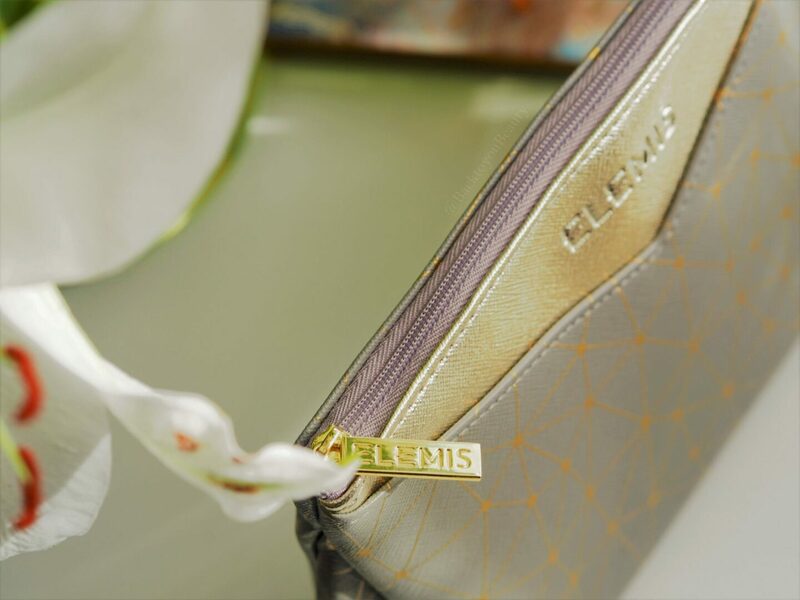 Included in this 4 piece collection is a beautiful new launch from Elemis as well as three much loved products and a gorgeous cosmetics bag. This collection is here to be enjoyed. Whether your skin is ageing, thinning or loosing elasticity, the Pro-Definition range is able to restore and contour using an innovation system of ground breaking technology. If you have recently lost weight, given birth or a period of stress has seen your skin begin to sag, this would be a wonderful range to try. 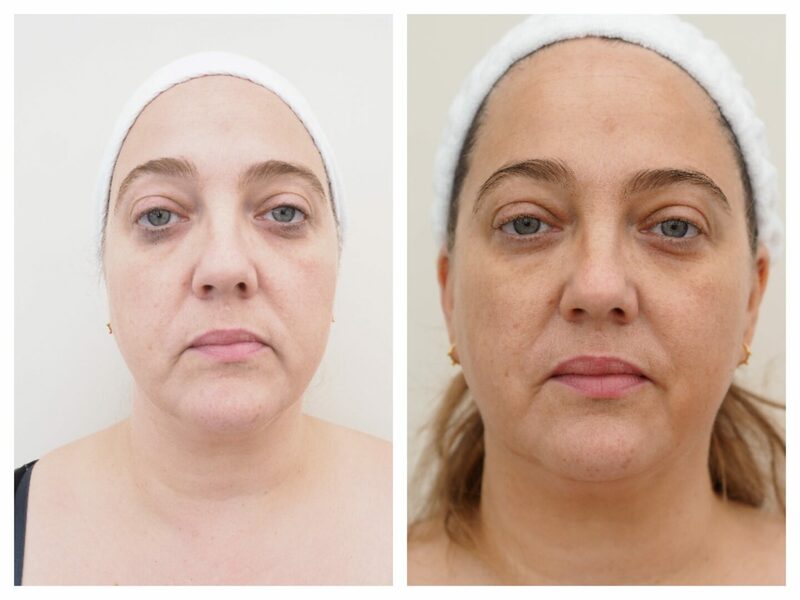 For me, with a mature skin, with lines, wrinkles and sagging around the jaw area, I have seen amazing results in just a few short weeks of solely using this system. 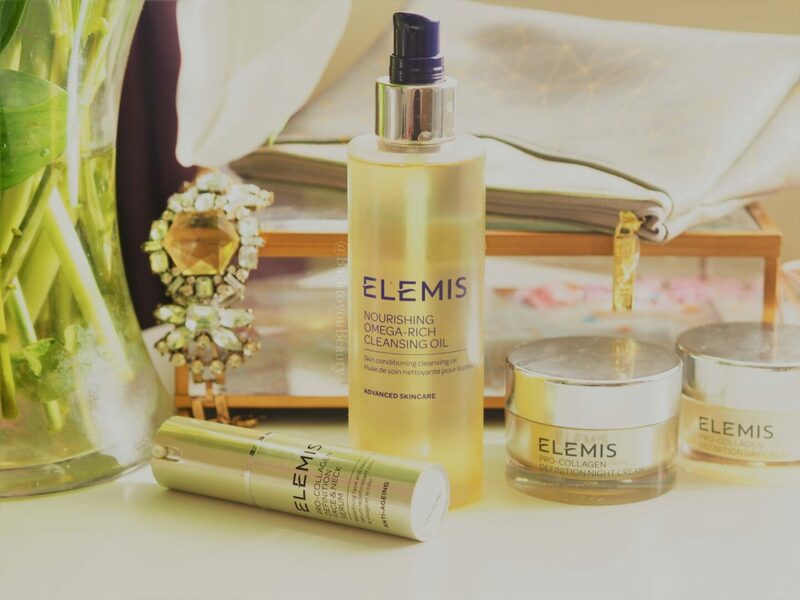 Just a couple of years old, this decadently nourishing Omega-Rich cleansing oil has fast become a customer favourite. With over 90% natural oils and formulated to ensure it maintains the skins delicate PH 4.5-5.5. this cleansing oil cuts through make up and SPF like a hot knife through butter. Fantastic at removing long wearing and waterproof make up, this is a product I happily take over my eyes and into my eyelashes with no concerns of greasy residue or sensitivity. Containing Winter Rose Oil, Chia Seed and Vitamin Rich Pomegranate, not only does the skin feel thoroughly cleansed after use, but it also feels smooth, plump, perfectly balanced and nourished. What a great way to start your skincare regime? Easy to use, and wonderful on all skin types including oily, a couple of pumps is all you need. I apply it to dry skin and gently massage in, taking it down my neck and over my décolleté and breath in those wonderful aromas, I then add a few drops of water which turns it into a milky emulsion, rinse and pat dry. Honestly, skin is left feeling so plump and hydrated that it feels as though you have completed your skincare journey, but this is just the beginning…. Drum roll please…. as this new launch really does deserve one. 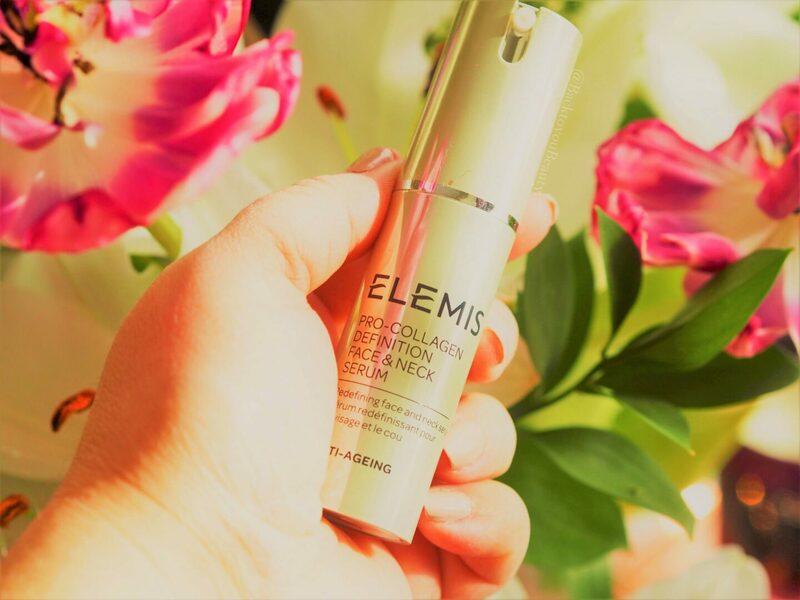 This incredibly lightweight serum is Elemis’ most advanced anti-ageing serum that literally melts into the skin, leaving behind the most satin soft, almost blurred look and feel. The texture is just incredible and the serum itself is packed full of Plant Stem Cells, Peptides, Oils and Vitamins. The tube may appear small, but boy is this serum mighty and 15ml lasts ever such a long time as it is very concentrated. This water based serum is incredible at not only offering an extra layer of hydration but thanks to those all important ingredients : Persian Silk Tree Bark Extract and Shea Butter, it also deeply nourishes the skin and reduces inflammation. A more hydrated skin works at lessening out the appearance of fine lines alongside Edelweiss which is renowned for restoring the underlying skins structures, thus giving the skin a more contoured appearance. It is a super powerful, natural anti-ager! Bye bye lines and wrinkles I say! Add to that the added benefits of Radish Root – which contains essential vitamins and minerals to detoxify, reduce puffiness and tone the skin, and a plethora of oils including Frankincense – which not only is a feel-good calming scent but also strengthens the skin, and this is a powerful weapon against ageing skin. Having been testing this serum exclusively alongside the rest of the collection for a little over two weeks, I am thrilled to say I can notice a big change in my skin. You can see the results for yourself below. Lets just take a moment to look at the packaging. 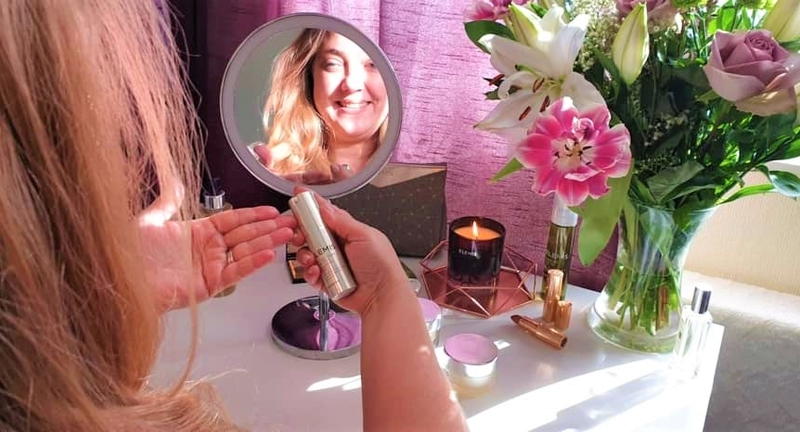 I know we are obviously more concerned with the contents but recently chatting with some girlfriends, they mentioned how the look of a product, makes them leave it out on their dressing table more, which then makes them use it more. Which leads back to the glamour of 1950’s Hollywood. Dressing tables would always be adorned with lotions and potions and actresses would take the time at night to sit, and massage in said creams. 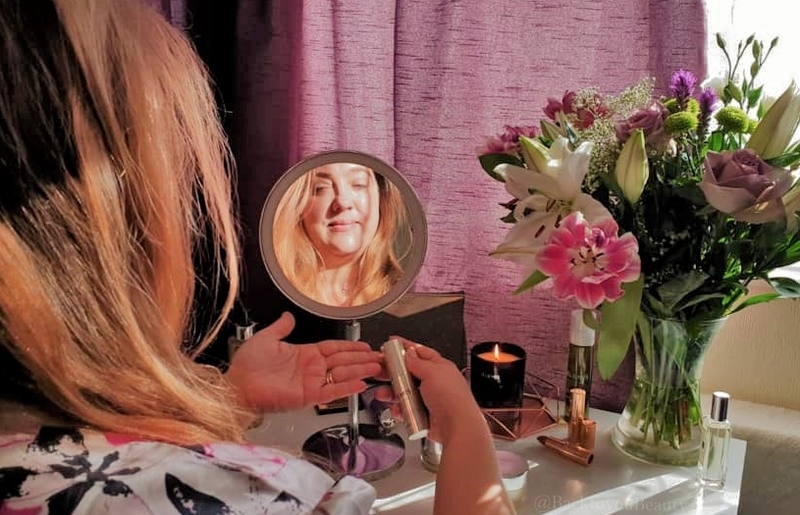 I know only to well that we live in a rushed society, but using this collection, soley, made me sit each morning and evening, at my dressing table and take the time to inhale the beautiful scent and massage the products into my skin. Pro-Collagen Day Cream has the most exquisite fragrance. It is like a sweet, uplifting floral, but with a warm and soothing background. I have really been taking my time to massage this into my skin in the mornings paying particular attention to my jaw area, cheeks and forhead lines. It is sation smooth, like the serum and dries down to a soft matte finish which is perfect for applying make up on. Full of those all important plant stem cells, you can almost feel it tightening and strenghting the skin. As with the day cream , I have really been enjoying my time massaging this into my face neck and decollete of an evening. The cream is super lightweight with an almost “bouncy” texture that gets deep into the skin. Working in perfect harmony with the day cream, this night cream lifts and sculpts the skin whilst we are sleeping. 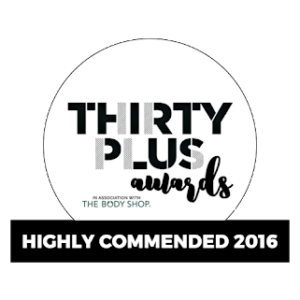 As you know the skin works really hard whilst we are resting, to replenish and repair. Containing one of my favourite flowers, Gardenia, which increases cellular regeneration, Lupin and Arjuna Bark this cream contains everything to lift and firm saggy, slackened skin. Use after cleansing by warming a pea sized amount between your fingers and gently massage over the face. I massage upwards and really lift the saggy (yuk) parts of my face whilst doing it. Pro-Definition Night Cream is cooling on the skin and sinks in very easily, leaving no sticky residue on your pillow. An absolute pleasure to use. 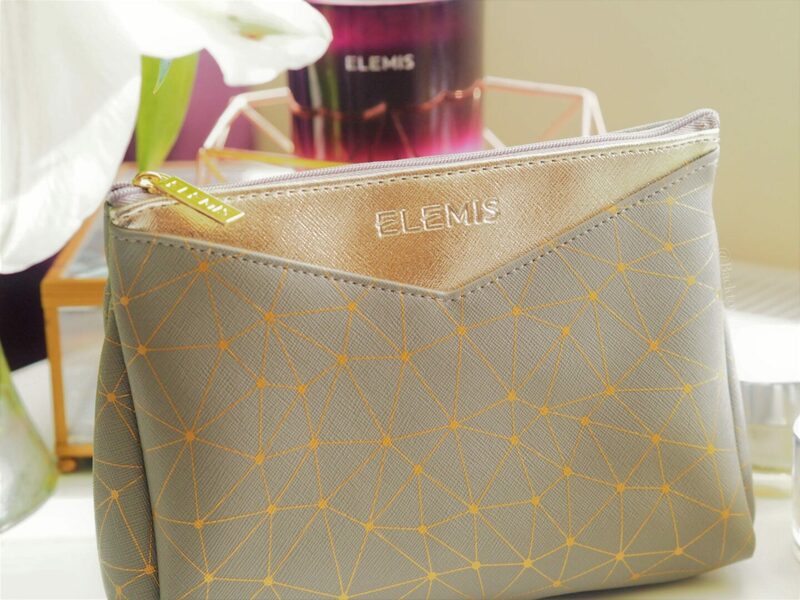 This collection also comes with a beautiful, and perhaps one of my favourite, cosmetics bags. It is wipe clean and has a lovely grey/gold colourway. Perfect for taking products away with you or even for using as a make up bag. Having been using soley this collection and no other skincare for two weeks, I am thrilled by my results. 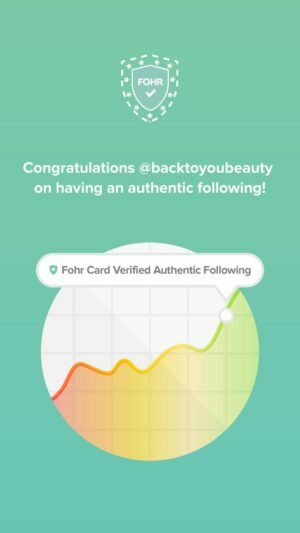 Now, we all know I look like an egg in my before and after photos but I wanted to show you my results after 14 days. 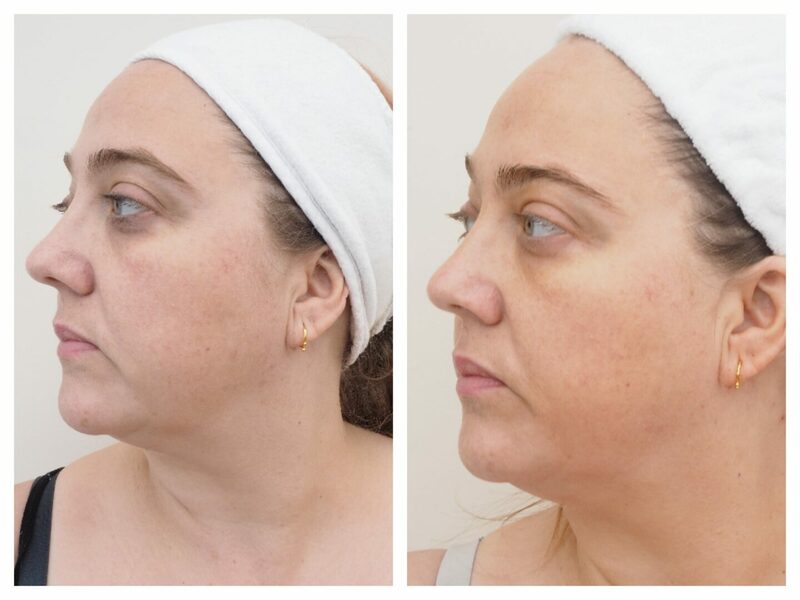 Going into this trial my skin was a grey (almost white) from Winter, slackened due to gaining and then loosing a few pounds over Christmas and into January and needed a lift and a boost. My skin now feels incredibly smooth each day, looks glowing ( I mean look at the difference in tone due to enjoying the massage process) and almost dewy and the texture is very refined, plus any sagging I have around my mouth and nose to mouth lines is already appearing less so!! The wrinkles around my eyes are plumped out and my overall look is just more fresh faced and youthful. 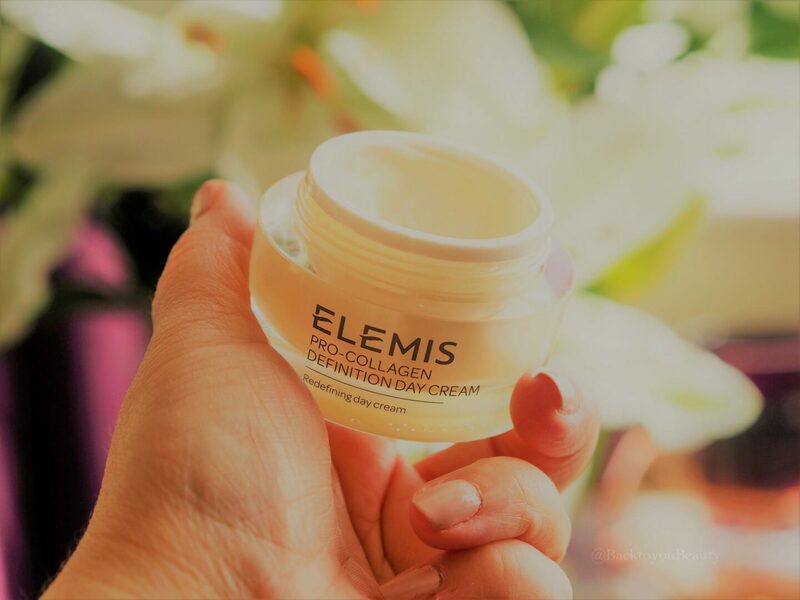 For me this is an amazing addition to my Pro-Collagen Marine Cream system, as I can slot this in for a month or so before a holiday or special event or just to give my ageing skin that much needed lift and boost. I am thrilled with these results in such a short time so imagine after a month plus! Can you notice the difference? Pro-Collagen Definiton (previously known as Pro-Intense) has not been seen in a QVC TSV for two years so I would highly recommend you get it, if it is a range you love, or a range you now think you need. The price is outstanding as the day cream alone is worth £69.00 and the whole collection is less than that!! Take some time for you each morning and evening and enjoy looking after your skin, massaging the products in and seeing how amazing your skin can really be. I hope you enjoy this collection and would love to hear from you. Please leave me a comment below and have a lovely day. "SBC Ultimate Propolis Collection – QVCUK TSV"
Sounds lovely and I can see the difference in your skin. But bit too expensive for me at the moment – shame no easy pays. I was SO close to buying this, but I just couldn’t justify it!